My 10yr old daughter wore this for Halloween this year. 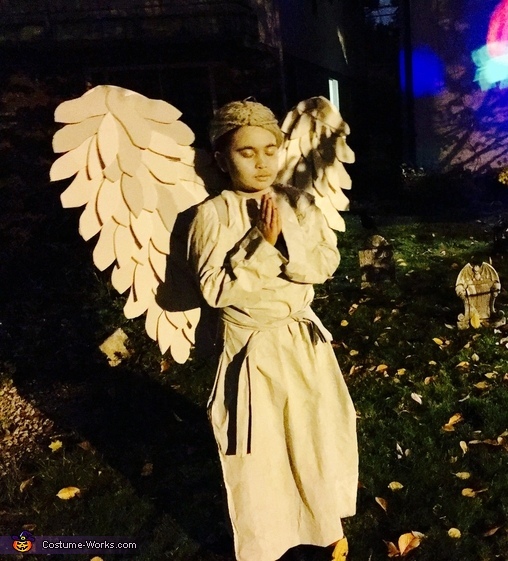 She asked me to help her create a stone angel costume like they have at the cemetery. We created the wings out of foam board. Cut each of the feathers separately and hot glued them onto a larger piece of foam board that we shaped into wings. The hair is made out of yarn, and hot glued and stiched onto a skull cap. The dress is an old bedsheet that we stiched into a dress and painted grey. The whole process took about a week and everyone who saw her was amazed!